Definition. Healing reactions are temporary symptoms that occur only on deep healing regimens in which the body retraces or goes back and heals old infections, wounds, injuries, or other imbalances from the past. Many are related to eliminating toxic substances, healing chronic infections, or metabolic shifts that take place as a body heals and its vitality increases. Other texts may refer to healing reactions as flare-ups, crises, retracing reactions, Jarisch-Herxheimer reactions, Herxheimer reactions, Lucio’s Phenomena, die-off reactions, purification reactions, the reversal process, aggravations or exacerbations. Healing crises or reactions are an essential feature of all true and deep healing methods. They can be unpleasant and rarely are frightening. However, they are welcome signs of healing. If they did not occur, one knows that a healing method may offer symptomatic relief, but usually it is not as deep healing as those therapies that cause healing reactions. Among the medical sciences that cause these reactions are chiropractic, homeopathy, some psychotherapy such as psychoanalysis, some herbal remedies, and nutritional balancing science. Retracing is poorly understood. Healing reactions are little understood in allopathic medical practice because they rarely occur with drug medicine approaches. They also do not occur with most herbal, nutritional and other holistic and naturopathic approaches to health care. As a result, most people, including doctors, are unfamiliar with them and often frightened of them. However, anyone who undertakes nutritional balancing therapy may experience them at times, at least to some degree. Therefore, it is excellent to understand them better. Symptoms of retracing. Most healing reactions are mild and pass quickly. Symptoms may include almost anything. One could experience diarrhea, constipation, aches, pains, muscle cramps, discharges, odors, rashes, headaches, irritability or fatigue. Rarely, symptoms are more vigorous, such as a vigorous cold, flu, or even retracing an old case of pneumonia or hepatitis. Once again, these usually do not last long. Emotional and psychological healing reactions are among the most interesting, and often the most important. Typical symptoms include feelings of anxiety, depression, fear or anger. However, as with the physical symptoms, almost any symptom is possible, depending upon a person’s past traumas and experiences. At times, more intense psychological and emotional retracing occurs with nutritional balancing. This often has to do with retracing old emotional traumas and molestation. However, in almost all cases, the body will not undertake a healing reaction unless it can see it through to completion. For this reason, reassurance and general supportive measures are usually all that is required during even an intense reaction. These measures are discussed below. Retracing reactions may be described as flare-ups of secondary chaos in terms of chaos theory. Chaos theory is a very modern and interesting science. The concept is that when a system is not working right, it causes chaos. As the system is fixed or corrected, the degree of chaos diminishes. However, at times, secondary chaos may occur. This is an apt description of a healing reaction. In our biological terms, a sick body is one that is in a high state of chaos. Nutritional balancing reduces this chaos. However, along the way, more chaos may erupt for a while as the body heals. This is a rough description of what occurs in a healing reaction. Caution: At times, reactions are not due to healing and indicate a worsening of a health condition. This happened to this author, and it happens to many people. One reads about retracing, and just assumes that any symptom that arises is a healing or retracing reaction. It can be vitally important to know if a reaction is due to healing or a worsening of a condition. Answering the five questions below can help one to know which is occurring. One can change emotionally as well as physically during sauna therapy. Anyone undergoing a nutritional balancing healing program needs to be prepared for these emotional shifts as body chemistry improves. Causes of these changes are elimination of toxins that affect the brain and improvements in clarity of thought. Other mechanisms involve returning to earlier states of body chemistry that are associated with specific emotional states or traumas, or elimination of what may be called emotional toxins. Physically-Linked Reactions: Some emotional toxins are linked to physical toxins and impaired body chemistry. An unhealthy body sends negative messages to the brain. These may be experienced as feelings of fear, anxiety or unworthiness. Energy-Related Reactions: Though often not taught in psychology, energy is required to feel feelings, even to feel a depression. Many times, a mineral analysis has revealed a pattern associated with depression. The client, however, denied the feeling. After weeks or months on a healing program, the client called and may blame me or the healing program for causing feelings of depression. In fact, the healing program merely enhanced the client’s energy and awareness. The client began to feel what had previously been inaccessible or suppressed. Once the feelings surface, they usually resolve quickly on their own. The brain, like the body, is self-healing provided it functions correctly. For a psychological view of this phenomenon, I recommend a few older psychology books, Arthur Janov’s The Primal Scream and The Primal Revolution. Enhanced energy due to natural therapies causes the brain to function better. Clarity of thinking, memory and awareness often improve. This assists one to question beliefs about oneself and about the world. More capable of understanding oneself, one lets go of false beliefs and destructive behaviors. Completion Reactions: Incompletely healed traumas leave emotional residues. Small children often cry hard when they fall down. They ‘work through’ the trauma in ten minutes and soon are laughing as if nothing happened. This is the proper way to handle a trauma. If energy is low or if healing is interrupted for some other reason, a residue of the experience remains and one develops fears or other neuroses. As energy and cognition improve, one often spontaneously heals residues of unhealed traumas. Simple adjustment reactions: These are common and involve a simple replacement of a toxic mineral with a more physiological mineral, or the correction of a simple enzyme system of the body. Another simple reaction or adjustment is the improvement in a glandular or organ activity. Spiritual Reactions – reducing chaos on a larger scale. These are discussed below. 1. Rest lying down as much as possible. Also, reduce stress and strain. Conserve energy for healing. Reduce mental as well as physical activity. Breathing deeply and slowly is very calming for the nervous system. 2. Eat lightly. Digestion is an extra stress during healing reactions. If one is very uncomfortable, it may be best to skip a meal. One may notice that symptoms subside after eating a meal. The meal is not making one better. Energy must be diverted from healing to digest the meal, so symptoms temporarily diminish while one digests. While drinking adequate water is important during healing reactions, guzzling extra water is usually not helpful. 3. Discontinue most nutritional supplements until a reaction passes. Reactions will proceed without most supplements. Some can impair the healing process. See below for exceptions. 4. Shorten sauna sessions. Continuing with long sauna sessions can intensify a healing reaction. If the liver is being overloaded with toxins, this may not be desirable. It may be best to cease using a sauna or reduce the frequency and duration of sessions until the reaction passes. On the other hand, for clearing an infection, healing a wound or injury or certain other conditions, continuing or even increasing sauna sessions may get it over with faster. 5. Other detoxification procedures are often helpful. Besides more short sauna sessions, other procedures include coffee enemas, colonic irrigation, massage, chiropractic, energy balancing and acupressure. Enemas are excellent and perhaps essential if one feels constipated and toxic. Chiropractic and energy balancing may also be most helpful. 6. Call someone familiar with healing reactions if one is unsure how to handle them. Several patients went to emergency rooms instead of calling me when they experienced healing reactions. They wasted hundreds of dollars and received no benefit. Those that stayed in touch passed through healing reactions, some very vigorous, without needing medical treatment. 7. Use care in discussing healing reactions with physicians and others unfamiliar with them. Healing symptoms can easily be misinterpreted as illness. This is a common problem. Unless the doctor, friend or family member understands, costly tests and toxic medication may be recommended. Medication can complicate reactions and is rarely effective. Reactions will usually proceed in spite of it. For toxic reactions in general: As toxins are mobilized and eliminated, one may experience headaches, rashes, pain, dizziness, abdominal discomfort and other symptoms. Sauna therapy usually helps symptoms pass quickly. If a symptom persists, ox bile, dehydrocholic acid and silymarin can enhance liver detoxification. Coffee enemas or colonic irrigation enhance elimination through the colon. One may induce vomiting if extreme nausea is present. Drink salt water first, so the stomach is not empty. Lying down and remaining quiet for half an hour or more is often very beneficial. Always watch infections, regardless of the possible causes. Always make sure that one’s temperature does not rise above about 103-104 F. and that one is well-hydrated when fever is present. However, if a person is following a nutritional balancing program, most infections, no matter how vigorous they seem, are totally benign and should never be suppressed with drugs, too much vitamin C or other remedies. Common sites of chronic infections are the sinuses, ears, eyes, throat, bronchials, lungs, intestines, kidneys and bladder. These and many other infections commonly flare up as they are healed. They go from chronic to acute, and are then eliminated. This is the reverse order in which they took hold in the body. Here are some simple and safe supportive therapies that are excellent for retracing infections. Heat. Heat activates the immune system and may disable or even kill some microorganisms. Sauna use is excellent to help heal chronic infections. A hot bath, perhaps with several pounds of Epsom salts in it, may also be helpful and can be repeated several days in a row. If using an infrared electric light sauna, expose the infected area to more infrared as this can speed healing in some cases. Another excellent idea is to shine one or more red heat lamps on the thymus gland area, which is the middle of the chest or breast bone. Do this for 30 minutes at a time, twice or three times daily. This may also speed up healing. Diet. Eat lightly. Drink plenty of spring or distilled water. Chicken soup appears to help with some infections. Do not eat fruit or fruit juices, as they are too yin. Stay with the recommended diet but just eat less, especially if you are not too hungry. Never eat a lot when sick. Colloidal silver. I prefer the following brands, although other may work well, too. Arabesque, Endomet, Sovereign Silver and Live Silver. The usual dose for an adult is about 1 tablespoon three times daily, taken by itself, at least 15 minutes away from all food and all beverages before and after taking it. It may also be applied locally by sniffing it, inhaling it or putting it on the skin or a drop in an ear, for example. Bee propolis. This is more convenient in tablets or capsules, but also comes in liquid form. Follow the instructions on the bottle, since the dosages may vary. It is very safe, so it is hard to overdo. Zinc, vitamins A and C, echinacea and astralagus. These are also helpful for many infections, though not all. Warning: do not use high-dose vitamin C as a general rule. It upsets body chemistry, lowers copper, is too yin and not needed. Especially avoid ALL extra vitamin C if a person is a fast oxidizer or is in a four lows pattern. Retracing an infection while in a four lows pattern. This type of infectious process is often a healing process, and as with most healing reactions, it must not be suppressed with drugs, vitamin C or anything else. Just mild support and the suggestions above are usually enough. Call a nutritional balancing practitioner if you are not sure what to do. For pain in the liver or kidney area. For pain in the area of the liver, take extra ox bile, pancreatin and dehydrocholic acid (GB-3 by Endomet Labs) and silymarin up to 50 drops three times a day or up to 3 capsules three times per day of a standardized product. Coffee enemas may also be helpful for discomfort in the area of the liver. For diarrhea. Elimination of antibiotics, metals or toxic chemicals may cause diarrhea. Rest plenty and eat lightly. Six charcoal tablets, three times per day will help absorb toxins. Lactobacillus plantarum capsules (from BioEnergy Systems), at least three, three times daily, may also be helpful. Bee propolis or grapefruit seed extract may help with intestinal infections. Well-cooked garlic or 15 garlic capsules daily may be needed if one is releasing parasites. Eat lightly of non-fibrous, non-irritating foods such as rice, other grains, chicken and vegetable soup until diarrhea passes. Severe diarrhea that persists requires intervention. Otherwise one may lose vital electrolytes and become dehydrated. For emotional reactions. Emotional traumas deeply held need to be brought to consciousness to be released. When emotions or negative thoughts arise, allow oneself to feel them without suppressing or wallowing in the feelings. For nervousness and anxiety. Elimination of stored caffeine, theophylline, diet pills or other stimulant substances can cause temporary feelings of anxiety as they are released. These will pass without requiring supportive therapy. Extreme fatigue or copper elimination can also cause feelings of anxiety. If a feeling is very intense or persistent, nutritional supplements of calcium, magnesium, zinc and choline have a calming effect. Liquid supplements will act faster. One may take up to 2500 mg of calcium, 1500 mg of magnesium, 100 mg of zinc and 800 mg of choline in a 24-hour period. For weight loss or gain. During nutritional balancing programs, weight may fluctuate. Weight gain may occur if the body retains water to buffer toxins that are being eliminated. Weight loss may occur even in a thin person as damaged tissue is broken down. One often will go through periods of greater tissue breakdown followed by periods of rebuilding. Shifts in glandular activity may temporarily cause weight gain or loss. Most shifts in weight are not a cause for concern. In some cases, eating more or fewer calories may assist in balancing weight during a detoxification program. Usually, however, the therapy program needs to take its course and weight will normalize after several months to several years, depending on the toxicity of the body. To slow healing reactions. According to Dr. Paul Eck, taking lecithin granules can help slow the elimination of toxic metals and chemicals. Taking aspirin, Tylenol, tranquilizers or other over the-counter remedies is never recommended. Medical intuitive Carolyn Myss and other authors discuss spiritual healing crises, spiritual depression and even “spiritual madness”. Anything that raises the body’s energy level or alters chemistry, including a nutritional balancing program, can precipitate such as crisis. Such a crisis may involve taking a leap of faith, letting go of old attachments, increasing self-awareness or a major shift in perspective. Many people are ill because they are secretly full of fear, guilt, self-hatred or self-loathing. A healing crisis may bring this to the surface. Such reactions often involve a phase of turmoil and confusion. After passing through such a crisis, some physical healing usually proceeds rapidly. Forewarned, most people handle healing reactions well. One should look forward to reactions as they are evidence of deep healing. Always call someone knowledgeable if 1) you are not sure what is going on, 2) you are concerned or worried, 3) any reaction becomes severe such as a high fever, or 4) a reaction continues for more than a few days. These guidelines are sufficient to handle most healing reactions. I have worked with over 40,000 clients. Healing reactions can be vigorous, but rarely dangerous. Always use common sense, however. Rarely, medical intervention is needed, but certainly not often. Taking medical drugs such as antibiotics and aspirin or others can prolong the reaction or even turn it into a dangerous situation. Almost all retracing reactions are totally benign. Some last for a few months, or can be very annoying, but most pass quickly and easily without a need for any extra interventions. Case #1. Robert, age 60, had had a severe car accident 30 years before in which he temporarily became paralyzed from the neck down. However, he seemed to recover after a few months, although his health was never very good after the accident. After about five years on a nutritional balancing program, he began to become weak and actually lost the ability to walk normally. He was hospitalized and doctors told him he had a neck injury that required immediate surgery. He postponed the surgery, and began a long recovery using an infrared lamp on the area, and a careful diet and supplements. Although he was recovering very slowly, he agreed to have neck surgery to release tension in the neck, but was progressing well before surgery as well. Case #2. Peter, age 78, was diagnosed with multiple myeloma. He was given 6 months to live. He chose to follow a nutritional balancing program and began to feel better almost immediately. He continued to feel better for about one and one-half years. However, when he was at his best, he began to have pain in his kidneys. This was likely a healing reaction as the body removed a lot of toxins through the kidneys. Unfortunately, in this case Peter’s family panicked, as they believed he was having a relapse of his cancer. They had him admitted to the hospital, where he was given a large dose of morphine, and perhaps other drugs. Peter’s body could not handle the highly toxic dose of morphine. He soon lapsed into a coma and died within a few days. This is the only case I have been involved with in 30 years in which someone died during what appears to have been a healing reaction. I believe this man was doing well and did not need to be hospitalized, where the doctors do not understand retracing and often use very toxic drugs in such cases, a very unwise practice. Case #3. Dr. Bernard Jensen describes a fatal healing reaction that occurred in one of his patients. The patient was a boy with an advanced cancer with a tumor pressing on his spinal cord. He was doing well on a corrective nutrition and lifestyle program. However, at one point, the tumor began to either grow or swell. This can happen as a tumor is necrosing or being absorbed by the body. It was just enough that it impinged on the spinal cord and the body stopped breathing and died. These cases are important because they point out possible dangers and necessary cautions that should be observed with any healing reaction. If the patient is very ill, very weak, old or debilitated, then extreme caution must be used. Also, while medical intervention is sometimes helpful, it can also be extremely harmful in some of these cases. During a retracing or healing reaction, it appears that one must essentially revisit the scene of the crime, to use a crude metaphor. There one must revisit, reframe, and redo an old insult to the body or the mind. This could be an ailment, an injury or some other type of emotional trauma, for example. This is needed, apparently, to heal the problem completely. It appears that this is the only way a person can build a firm and perfect foundation for further healing. One of the amazing aspects of retracing is that as the body’s energy or vitality level keeps increasing, the body seems to know the perfect order for retracing dozens of insults, injuries, infections and so on. At one time it may be an old case of poison ivy that flares up, while two months later it may be an emotional trauma involving a parent or sibling. 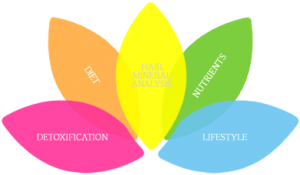 With nutritional balancing, the job of the practitioner and the client is to just keep balancing and supporting the body and it will automatically retrace and heal hundreds of old wounds, injuries, infections and much more by itself when the conditions are fulfilled to keep enhancing the homeostasis, vitality and nutrition of the body. It is quite an amazing process to behold, although it can be annoying and even scary, at times. This has something to do with a concept called Etheric Reset. One can read about healing reactions in texts on homeopathy, chiropractic and psychotherapy where they may be referred to as the catharsis. Max Gerson, MD, in A Cancer Therapy – Results of 50 Cases, devoted an entire chapter to them. William Frederich Koch, MD mentions them often in his excellent book, The Survival Factor in Neoplastic and Viral Diseases. Bernard Jensen, DC, ND wrote about them in The Doctor-Patient Handbook.